Calvin Abueva got the better of Cliff Hodge in a match-up between the league’s top two rookies last night. Abueva logged 20 points, 18 rebounds, 3 assists, 2 steals, and 1 block for a whopping 51.00 EFF (as calculated by PBA-Online.net). Hodge, meanwhile, bounced back from his poor play against Global Port a few days ago by registering 13 points, 9 rebounds, 3 assists, 2 blocks, and 1 steal. That line was good enough for an impressive 36.41 EFF. Abueva was clearly the better rookie here, and CLEARLY the best player out there on the floor bar none. This was his best PBA game yet, and something tells me the kid form Baste has more in store for the loyal fans of Alaska. Heck, if he keeps this up, it might not be far-fetched to include him in the MVP consideration, too! Rookie-MVP? It’s VERY possible. rookie Cliff Hodge last night. Calvin Abueva is back and Alaska, similarly, is back on the winning track. The hardworking rookie Abueva brought his usual energy and the rest of the Aces grinded out an 88-85 win over the Meralco Bolts in the PBA Philippine Cup on Wednesday night at the SMART-Araneta Coliseum. Abueva led his team both in scoring and rebounding in his first game back since being hospitalized due to nasal infection. He finished with 20 points, 18 rebounds and two steals in 36 minutes of play. The barely 6-foot-2, do-it-all forward, was all over the floor – hustling, chasing down loose balls and helping out on defense as well as scoring and grabbing rebounds. Although Abueva proved to be steady all game long, the Aces needed two crucial three-pointers from JVee Casio and Mac Baracael inside the final two minutes to outlast the Bolts. Casio, whose three-pointer hit the backboard before going in, tied the count for the last time at 82-all. In the return play, the Bolts failed to execute, and the Aces punished them by finding Baracael, who was wide open from the left flank. The 6-foot-3 sophomore forward sank the trey for an 85-82 count, with still more than a minute left. Another unproductive thrust by the Bolts led to a fastbreak by Alaska and Cyrus Baguio kept things well in hand for the Aces by finishing on transition for an 87-82 lead. Reynel Hugnatan completed a three-point play for the Bolts in the next play to give his team one last push. With only 9.5 seconds left, Meralco opted to foul Casio, who split his charities and left a window of opportunity for the Bolts. 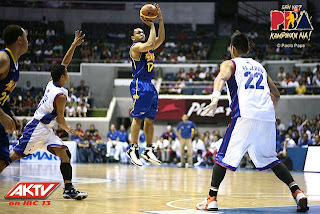 Unfortunately, the Bolts’ Ronjay Buenafe missed a trey. 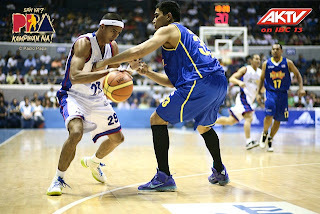 Cliff Hodge chased the ball and attempted from deep left while drawing a contact from Abueva. 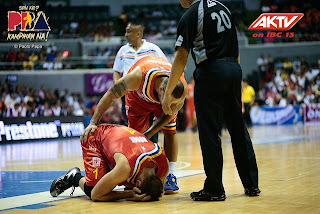 The referees, however, waived the foul called on Abueva after reviewing that there was no more time left on the clock. ALA 88 – Abueva 20, Baguio 19, Baracael 12, Thoss 12, Casio 9, Espinas 7, Jazul 6, Dela Cruz 2, Eman 1, Reyes 0, Hontiveros 0. 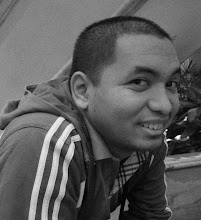 MER 85 – Ross 14, Cardona 14, Hodge 13, Hugnatan 11, Mercado 10, Borboran 9, Nabong 6, Reyes 5, Buenafe 3, Salvacion 0. QS: 24-21, 43-34, 64-66, 88-85. JV Casio lobs one over Meralco's Reynel Hugnatan. Cliff Hodge and the Bolts went down against the gritty Aces. Nearing the end of the elimination round, two-time reigning Philippine Cup champion Talk ‘N Text is right where they hoped to be – on top of the standings. The Tropang Texters played tough defense down the stretch against the Petron Blaze Boosters, holding their rivals to a single field goal in the last five minutes, en route to a 95-82 triumph at the SMART-Araneta Coliseum to secure one of the top two spots and the twice-to-beat bonus in the eight-team PBA Philippine Cup quarterfinals. “We’ve achieved our target, which is securing the top spot and a twice-to-beat advantage. We played with a total team effort and played with balanced offense,” said Talk ‘N Text coach Norman Black. The game was tied, 66-all, at the end of three quarters and was close up until the last six minutes, where Petron trailed by just a single point, 81-80, after free throws from Alex Cabagnot. But the Tropang Texters were able to outscore the Boosters, 12-2, in the last five minutes as Talk ‘N Text closed out strong to stay on top of the standings with an 11-2 card. No player was able to score for Petron Blaze after Arwind Santos made a bucket at the 3:19 mark of the fourth period. 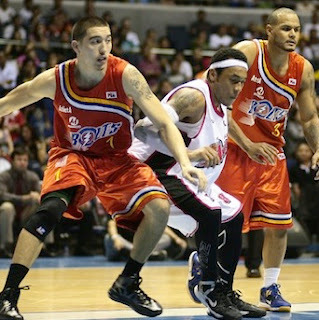 Talk ‘N Text’s victory snapped Petron’s three-game winning streak. The Boosters fell to a 6-7 card and dropped to seventh place. TNT 95 – Castro 23, Williams 14, Reyes 12, Alapag 11, De Ocampo 10, Peek 9, Dillinger 8, Fonacier 6, Carey 2, Aban 0, Alvarez 0. 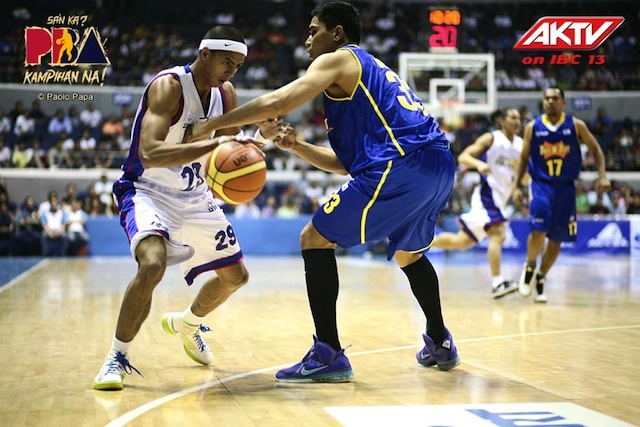 PET 82 – Santos 22, Cabagnot 17, Lassiter 12, Fajardo 7, Lutz 7, Yeo 5, Washington 5, Faundo 4, Miranda 3, Duncil 0. QS: 15-18, 38-44, 66-66, 95-82.
against the mighty Tropang Texters. 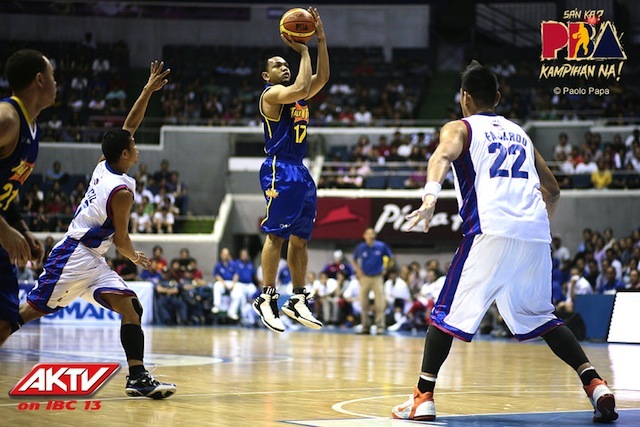 Jayson Castro led the way anew for TNT's 11th win. 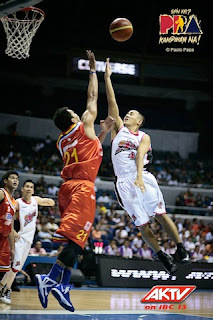 Ryan Reyes soars over Petron's Jojo Duncil.